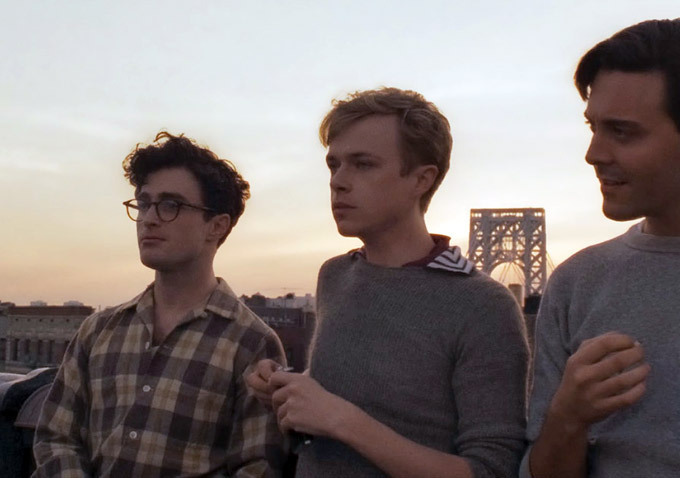 Kill Your Darlings – From left: Daniel Radcliffe as Allan Ginsberg, Dane DeHann as Lucien Carr and Jack Huston as Jack Kerouac. John Krokidas as author and director alongside his pal Austin Bunn as scriptwriter use a mishmash of quotes from the Beats, flinging ’em fast and furious, like jazz provocateurs exploring a riff. Some of these gems, I’d wager, came after the 1944 incident of Lucien Carr’s (Dane DeHaan) murder of David Kammerer (Michael C. Hall), but it doesn’t matter, it’s poetic license, and it works. Using Allen Ginsberg’s (Daniel Radcliffe) point-of-view, the film takes on Beat culture while anchoring itself to the incident of Kammerer’s murder to heighten the dramatic tension. We see a little of where Ginsburg comes from. His mother, played superbly by Jennifer Jason Leigh, is insane and his father (David Cross) ineffectual. Ginsberg meets Lucien Carr at Columbia. They become fast friends but, eventually, Ginsberg wants more which leads him to follow through on “first thought best thought,” by planting a wet one on Carr. Carr, not interested in Ginsberg’s advances, relegates “Ginsy” to the role of his new intellectual benefactor, and additionally, rids himself of his old benefactor, David Kammerer, by killing him in Riverside Park. Carr would go on to serve two years for first degree manslaughter in Upstate New York, but the film doesn’t take us that far. Scenes of furiously cutting up classics a la William Burroughs’ (Ben Foster) technique, and benzedrine, alcohol and ether induced states of discovery capture the energy of youthful experimentation during the era. Krokidas chose to use modern music for some scenes and jazz of the time for others keeping the exuberant momentum going. We experience the Beats’ sweaty, gritty exploration of ethics, sexuality, race, ethnic and socioeconomic class relations through a hazy lens of blue and yellow cigarette smoke in dorm rooms, jazz clubs and parties. Ben Foster as William Burroughs has the voice and affectation down, and Michael C. Hall brings sensitivity, longing, and creepiness to his portrayal of David Kammerer. There are a lot of thematic devices used, like death as a new beginning. One scene has Ginsberg and Carr hanging themselves in Carr’s dorm room. Unexpectedly, the chair kicks out from under them, they’re choking – we see a shot of the pipe as it breaks and they fall, surviving a simulated death experience. Oops, it’s a PVC pipe, not yet invented, but heck, it’s a minor detail. “Lu was the glue,” as Ginsberg has said about their gang, and Dane DeHann perfectly personifies the captivating character Lucien Carr must have been with his graceful androgynous sensuality. Daniel Radcliffe is outstanding as the nebbish that would become the poet avenger. He may have glasses, but he’s lost his magical Harry Potterness and his lovely British accent. His portrayal of Ginsberg is heartfelt and fierce. We can see how this young intelligent radical is poised to Howl. The use of the the romantic poets is well placed as Ginsberg and Carr discuss Yeats and begin crafting “A New Vision” based on Yeats’ “A Vision.” In another scene, Jack Kerouac’s (Jack Huston) reaction listening to his friend quoting Shelly’s Elegy for Keats as he suffers from a wound he’ll never recover from, in a war he doesn’t know if they’ll win, adds depth, complexity and context to the film. In scenes that exemplify the generation gap, John Cullum is perfect as the old guard English professor, Lionel Trilling as Ginsberg questions him about techniques in poetry. Each disregards the other’s opinion, and towards the end of the film, Ginsberg leaves Columbia defiantly unwilling to withdraw his “smutty” final paper about the Kammerer murder. The old professor saves face in the eyes of the institution, but secretly champions Ginsberg. In a final scene, Ginsberg sits with his father at home, smoking and listening to the radio. An announcement that WWII is over comes on just as Ginsberg opens his mail to find his “smutty” paper returned with words of encouragement. Both wars are over, the external, and the internal, for Ginsberg. Krokidas said in an interview that he and Bunn did extensive research but couldn’t get a hold of early works that are now available. If you’re interested in reading more about the early Beats or the murder, Krokidas cites The Book of Martyrdom and Artifice – a collection of early writings from Ginsberg’s journals about his relationships and adventures with the other Beat luminaries, so candid Ginsberg insisted it not be released until after his death, and The Hippos Were Boiled In Their Tanks, a noir style novel by Burroughs and Kerouac not released until after Carr’s death. The Kammerer murder has been credited as the violent event that gave birth to the Beat Generation. It did give everybody something to write about, that’s for sure, even generations later.